Yes, this is a real cause for a celebration! I wish Mr. K. and Heather the most happy & wonderful birthday filled with love, joy and merriment from morning till night -- and of course delicious birthday treats and cake. Watch those beards if they try to blow out the candles! 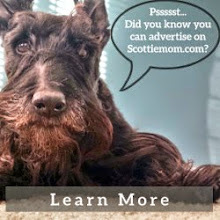 Your fans will be waiting to see all the pix that Scottie Mom will take. Have a safe trip and enjoy! Happy Birthday Mr K and Heather! You are the same ages as my two!! 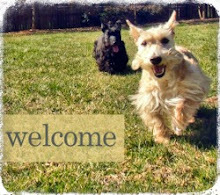 What fun and joy you Scotties bring to your humans lives!! Wishing your sweet Scottie's a fun birthday celebration!! HAPPY, HAPPY BARKDAY Heather & Mr K!! Can't wait to see pictures from your special day and outings. Happy Birthday and may they both have many more.....every day is a gift! I'm a rescue and came with some medical papers from Mexico that said I was born July 26. I stick with it because it seems reasonable. Kaci, is also a rescue and her paper from the rescue org. said she was born Feb 30th of this year (they really didn't know either-they pulled Kaci from a kill shelter). Good luck celebrating the Feb 30th think. We're going to have to pick a date like you did but it won't be the same as any peep or my date. Well I see I stopped by on your Birthday and you are having a party! ARRROOO It's your Birthday ~ Happy Birthday. Many happy AROOOOOOs from Macalister and Maggie! Such cool bday hats- Scotties are always stylin! Mac just turned 14 on 10/10 - so we're celebrating the whole month. Have a great bday w/e- enjoy your surprise!